Being the ceremony of spiritual union and the beginning of a lifelong commitment, a wedding is one of the most momentous events that could happen in one’s life. Having to say “I do” to the person you love is the most magical and most uplifting feeling anyone could ever have. And to make that single moment perfect, extensive preparations need to be done. Luckily, you won’t be doing it alone. 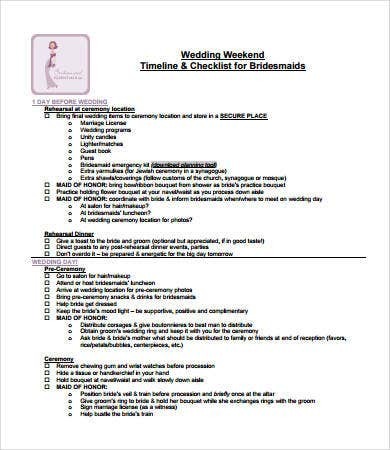 This site is packed with all kinds of timeline templates that could help you prepare for your wedding. With this, you can have everything arranged in a snap! Twelve to ten months. You ought to announce your engagement first. 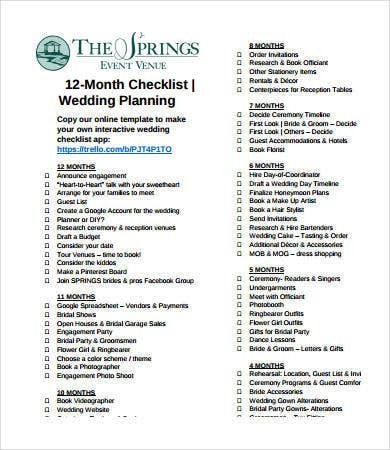 Set the wedding date and budget. 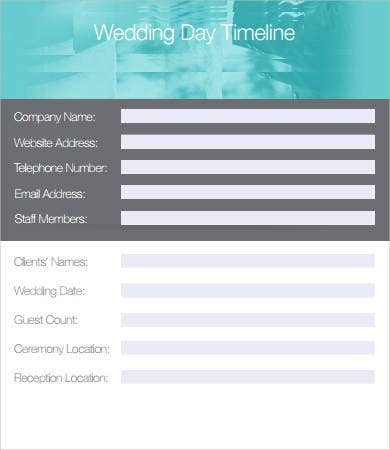 Create a guest list and book venues for the wedding and reception. Nine to seven months. Pick your wedding dress. Shop for dresses, tuxedos, and other accessories. Book florists, photographers, and videographers. Six to four months. Secure transportation and reserve rentals for the wedding. Also, send out invitations. Three to one months. Confirm RSVPs. Plan and book for your honeymoon. A week before. Have rehearsals and finalize arrangements. The day prior. Relax and allow plenty of time to get ready. Use confetti poppers upon entering. Dedicate songs or dance numbers. 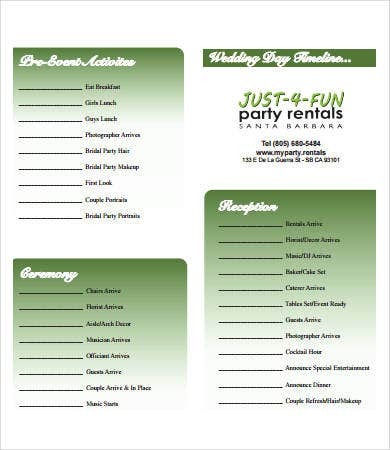 With the help of a wedding planer and the perfect wedding timeline, a successful and memorable wedding is a guarantee. 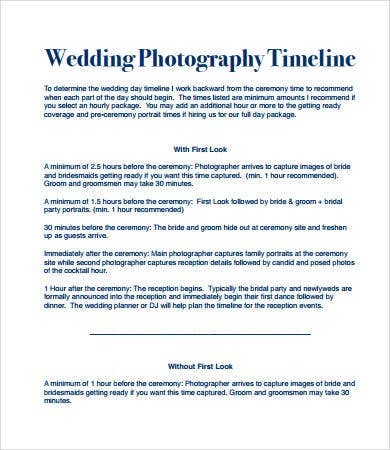 In this page, we offer a number of printable, ready to download wedding timeline templates that most newly engaged couples use for their wedding plans. 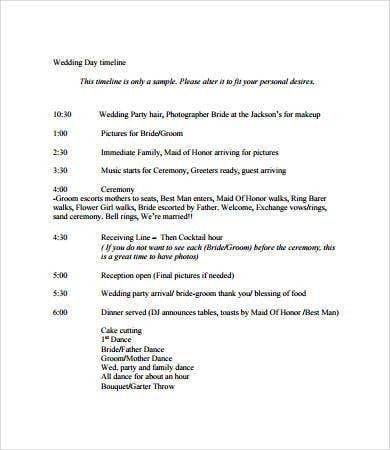 Some templates even provide a built-in event timeline templates and checklists to assist your preparations. 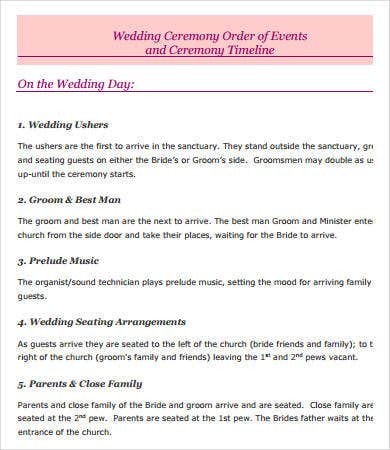 the order of events at the reception. Have the gown washed and preserved. Create or order your wedding album. 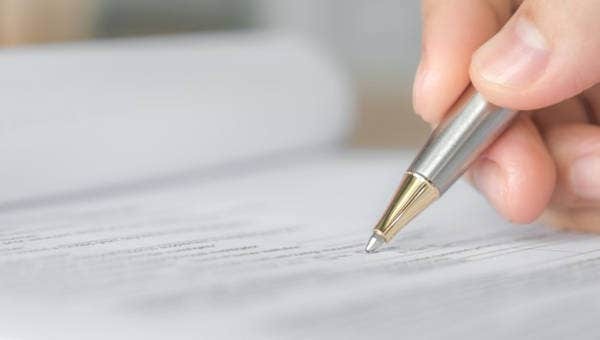 Legally change your last name. Plan some new adventure for the both of you. A wedding day is only the first step of the lifelong journey between two people. What you could happily do together is endless, for the best is yet to come.